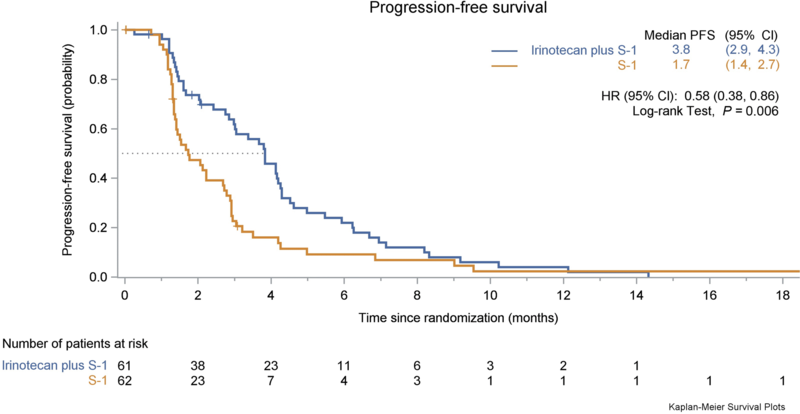 The clinical benefits of irinotecan , docetaxel , and ramucirumab  as second-line regimens for advanced esophageal adenocarcinoma have been validated in phase 3 trials, but the second-line treatment options for advanced ESCC patients remain investigational. The benefit of second-line targeted treatment in patients with advanced ESCC is still uncertain, and only a few treatment options are available . 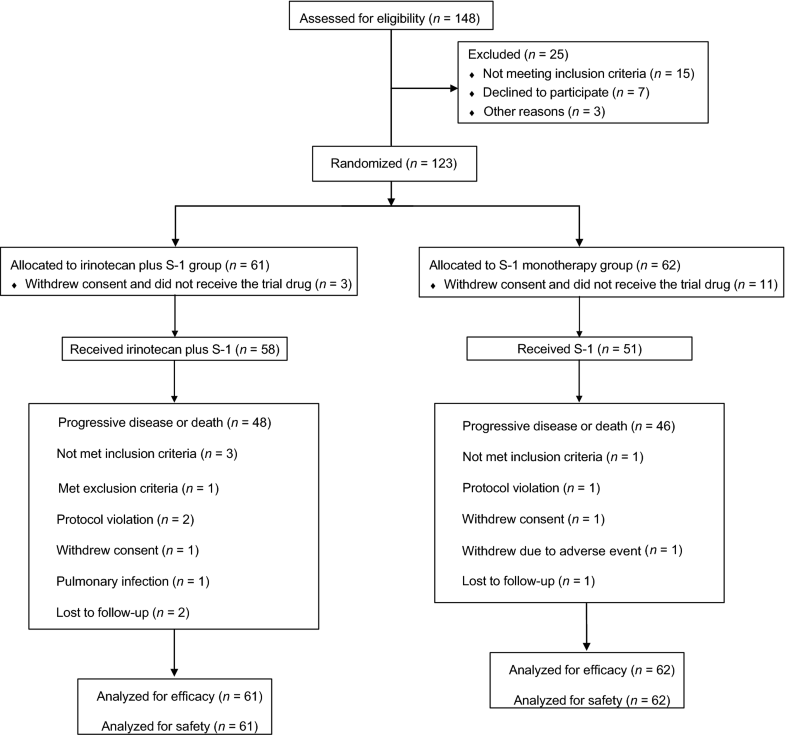 The Cancer Oesophagus Gefitinib (COG) trial , which included 50 patients with ESCC in the gefitinib arm, is the largest randomized phase 3 trial performed for esophageal cancer patients whose disease progressed after chemotherapy. In that study, the gefitinib arm demonstrated a modest antitumor efficacy with an overall response rate (ORR) of 2.7% and a disease control rate (DCR) of 24%, and the observed median progression-free survival (PFS) and OS were 1.57 months and 3.73 months, respectively. Although no OS benefit from gefitinib over placebo was observed, a small benefit in PFS (1.57 vs. 1.17 months, P = 0.020) was achieved. By comparison, in another phase 2 trial, when pretreated ESCC patients having epidermal growth factor receptor (EGFR) overexpression or amplification were treated with icotinib, an EGFR-tyrosine kinase inhibitors (TKI), they demonstrated an ORR of 16.7% and a median PFS of 52 days . It is noteworthy that despite the increased response rate in selected patients observed in the latter trial, the median PFS was still disappointing. Recently, the effect of immune checkpoint inhibitors on ESCC have also been evaluated in clinical trials, with ORR ranging between 17% and 33% and median PFS between 1.5 and 3.6 months [6–8]. However, only a small number of patients (n = 18–65) with ESCC were included in these phase 1/2 trials, and no standard treatments were established. As such, chemotherapy still remains the cornerstone in the treatment of advanced ESCC. 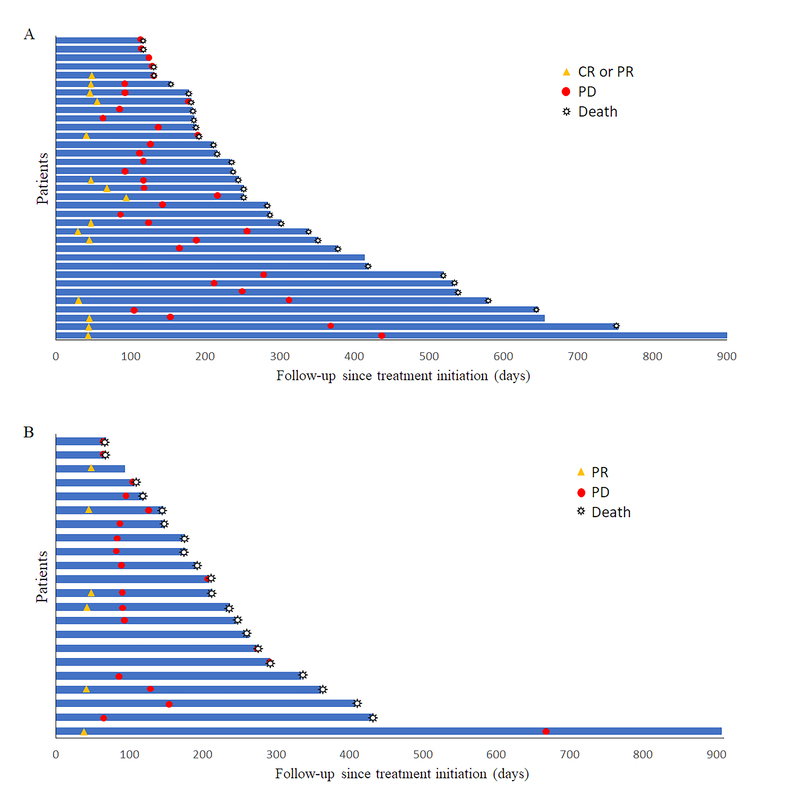 The combination of docetaxel with platinum has demonstrated a response rate of 25%–34.2% in metastatic ESCC patients whose disease progressed after first-line chemotherapy on platinum plus fluorouracil [9–11]. S-1, a fluoropyrimidine derivative, has been reported in a phase 2 trial as a second-line chemotherapy for patients with unresectable and recurrent ESCC, resulting in a median OS of 330 days . 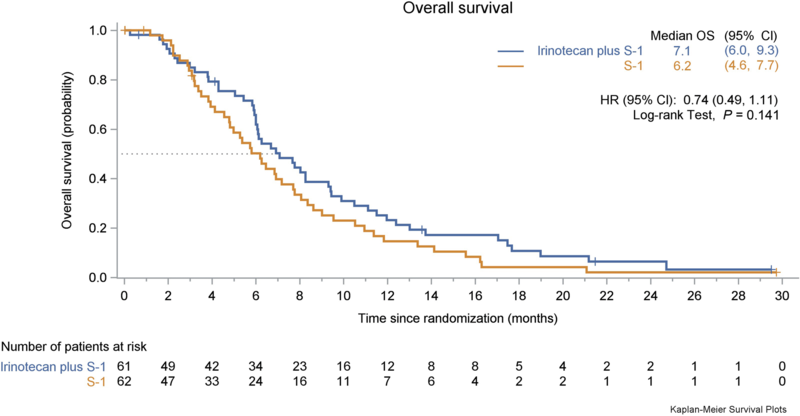 Irinotecan, a topoisomerase I inhibitor, has demonstrated moderate activity as a single agent in metastatic gastro-esophageal cancer . 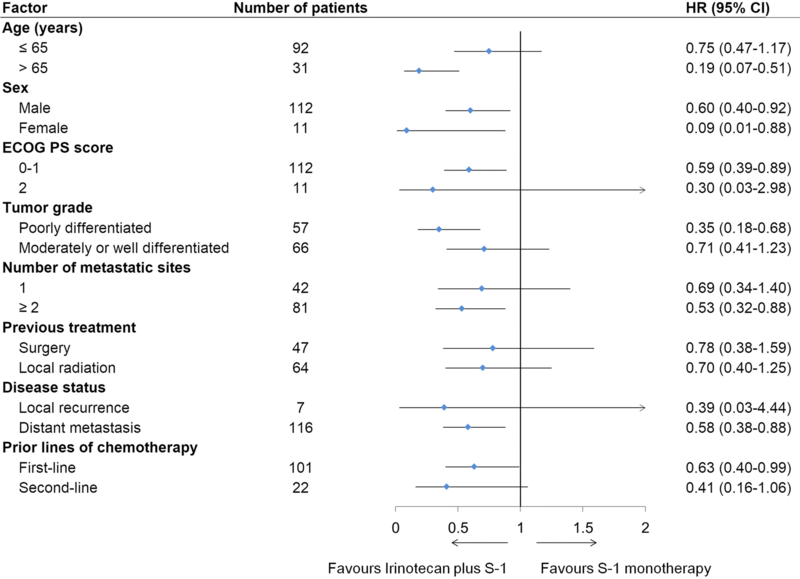 In our previous retrospective single institution study, we have observed a response rate of 29.6% in recurrent or metastatic ESCC patients treated with irinotecan plus a fluorouracil derivative as a second-line or third-line chemotherapy . However, since the treatment options for recurrent or metastatic ESCC is still limited and the reported results have not shown significant improvement in patients’ survival, in this open-labeled phase 3 ESWN 01 trial, we intended to explore the benefit of adding irinotecan to S-1 as a second- or third-line chemotherapy for recurrent or metastatic ESCC.